On Dec. 18, 2013, an annual holiday tradition was born when two noted attorneys squared off before a judge, jury and spectators at the Rensselear County Courthouse in downtown Troy—their purpose: to determine the literal truth. Who really wrote 'Twas the Night Before Christmas? Representing the Moore claim was upstate New York’s preeminent litigator, E. Stewart Jones, Jr. He was joined by Chris Post, a Moore descendant. On the side of Livingston were Troy novelist and attorney Jack Casey, author of “The Trial of Bat Shea,” and his daughter, attorney Molly Casey of Albany law firm Thuillez, Ford, Gold, Butler & Monroe. They were joined by Diane Dorring, a distant relative of Livingston. Both sides have a tenured history of law practice in the city. The trial’s ornate setting was The John T. Casey Ceremonial Court, named for Jack Casey’s father who served there as State Supreme Court Justice. Retired New York State Supreme Court Justice Bernard J. Malone heard the first mock trial to settle the contested authorship. 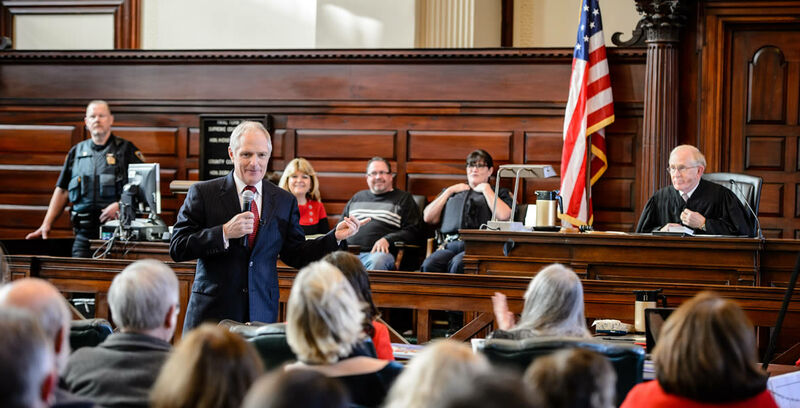 The trial unfolded before a packed standing-room only audience of more than 500, and featured real expert testimony mixed with a little holiday magic from beyond. Real court security officers, a clerk and court stenographer lent an authentic air to the event. A saxophone playing Santa Claus, a lively cameo from a long gone gangster who was famously tried in the same court, and other theatrical flares transformed the evening into one of wonder and high spirits. Reporters from The Wall Street Journal, Capital New York (Politico), Times Union, Troy Record, Metroland, WNYT Ch. 13 and many other media outlets squeezed into the press box and spread news of the trial around the world. After heated deliberation, the jury returned unable to arrive at a verdict. But the Caseys, on behalf of their Livingston clients, vowed to re-try the case again the following year. With no clear winner, Troy Mayor Lou Rosamilla issued a proclamation declaring December 23, 2013 to be Clement Clarke Moore & Henry Livingston, Jr. Day in Troy, New York, in recognition of this small American city’s role in holiday history. The event was created and hosted by Duncan Crary. There was a re-trial of this case on Sunday, Dec. 7, 2014 at 2 p.m. in the Rensselaer County Courthouse in downtown Troy, NY.